The International Music Camp is an experimental project in Ukraine, run by Kateryna Zavalko (violin, Ukraine) and Jane Francis (cello, UK) and based on teaching to young players, aged 6-10 using the 'Colourstrings' method. Kateryna's blog 'Music For Children' gives details of training young violinists with the Colourstrings method and how the shared experience of playing in the summer camp develops the playing of these young players. 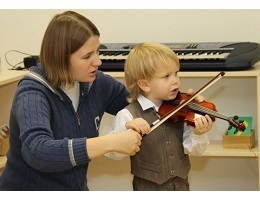 Stentor supported the expansion of cello teaching at the camp with the use of a Stentor Student II small size cello. We now also have a Stentor distributor in Ukraine - details here.